A full-length profile portrait of a man carrying several (?horn or ebony-pointed) spears, wearing armrings of metal and leather as well as earrings. 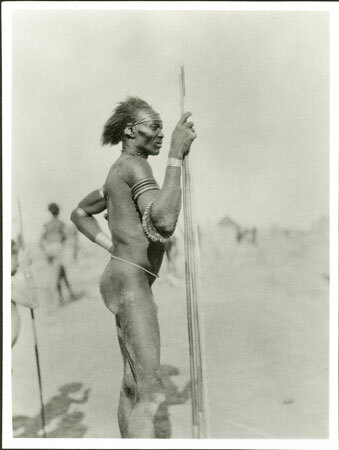 This image was published in 1933 with the caption Lek Tribesman, which suggests that this man was photographed during Evans-Pritchard's fieldwork among the Leek of the Bahr-el-Ghazal River area (Yoinyang) in 1930. Note on print reverse ms pencil - "31/4 80 "
Morton, Chris. "Nuer man" Southern Sudan Project (in development). 03 Jan. 2006. Pitt Rivers Museum. <http://southernsudan.prm.ox.ac.uk/details/1998.346.80/>.